With Elfa Décor, the beauty and warmth of natural wood meets the ultimate in customization. Add our exclusive solid wood Elfa Décor Fascia to Elfa Ventilated Shelves to create the look of custom built-ins with the visibility and flexibility of ventilated shelves. Now compatible with our Elfa Angled Solid Metal Shelves. Use our exclusive Elfa Décor Classic Knob drawer pull to create a high-style finishing touch for Elfa drawer fronts. Its rounded shape makes for easy functionality and the metallic hue provides a soft glimmer. With included hardware, it installs easily. White Elfa Décor Fascia is rated 4.8 out of 5 by 47. Rated 5 out of 5 by Jscotyd from Amazing Organization From the design phase with Troy and the Fashion Valley location in San Diego through a revision or two and finally to the installation - it was all amazing. The installer was perfect. Rated 5 out of 5 by AmandaSis from Happy customer This decor shelving is simply beautiful in my closet. The color and texture of the wood is very clean and classic. It’s easy enough to install, that I just had my husband drill the initial holes and I went from there. It feels sturdy once together. Now I want to redo my whole closet! Rated 5 out of 5 by Ultranerdx from Transformed My Elfa Closet We had our Elfa closet installed last September, but held off on buying the fascia because of the expense and because we knew there would be a 30% off sale in January. Once the sale rolled around, I debated buying it because it’s still not cheap and it worked just fine without it. But after pulling the trigger, I am SO HAPPY I did! It looks even a million times better than before, and “sparks happiness” every time I open my closet. It’s incredibly easy to install yourself, just watch a YouTube video first (Container Store, you should make one because the ones out there aren’t great.) Just beware that once the clips are in, I don’t know how to get them out if you want to make a change. If you’re on the fence, I recommend you go for it! (Before and after pics included). Rated 5 out of 5 by MikeRi from Plastic clip's middle groove goes under the rail. It takes about 15 minutes to figure out the installation of the first fascia cover if you do it wrong like I did. Just remember that the plastic clip has a groove in the top for a single rail. Initially I tried to fit one clip between two rails. After the first cover was installed, the rest of the covers took minimal time. Rated 5 out of 5 by KimLucie from Installed Myself I love the explanation to install I’m good with tools and not intimidated at all to do, however the directions speed up the installation! Rated 5 out of 5 by Jen1BQ from Love! Look great and super easy to install yourself! Really gives a finishing touch! Rated 5 out of 5 by Myrddin12 from Love everything Elfa! This is the first time I have purchased the Elfa Decor fascia and I love it. I prefer ventilated shelving in my closet, but I love the more finished look the fascia gives it. We have used Elfa for more than 20 years now in bedroom closets, hall closets, basement display wall, laundry room, bathroom, offices... Can't say enough amazing things about it. Only having one piece that screws in instead of every hanging standard is wonderful - and really allows the flexibility of changing design whenever you want. We have ventilated and solid melamine shelving, and again, this fascia adds a great touch to the ventilated without having to hit the sold decor shelves pricetag. I also love that I have been able to update the shelving we brought from our last house in our recent move. I would give 10 stars if possible! Oh - fascia is so easy to add on too - takes seconds. :-) And even though in general we are call-a-handyman kind of people, we have installed every bit of Elfa ourselves. SO easy! Rated 4 out of 5 by CHintz from Looks great This piece is kind of the cherry on top for your closet. If you can afford the additional detail, it makes the closet look a lot better. Rated 4 out of 5 by 4MJC from Too Few Choices on Sizing Installed very nicely. However, I find the sizing options require you to spend more while TCS/elfa manufactures less. You sell a 3' Ventilated Platinum Shelf but no 3' Walnut Fascia? So I have to use 2 18" which is more expensive and looks less finished. Falls a little flat. Rated 5 out of 5 by CJean from LOVE My elfa closet! I LOVE my new elfa closet system. It is flexible, functional, and beautiful! It truly helps optimize the storage space in my guest closet. The nice thing is that the modular design means that you can move things around if you find the original design doesn't quite work (or if your storage needs change down the road). Rated 4 out of 5 by ajeant from Great accessory to add polish to your closet Bought these to add to the angle metal shelves in my existing Elfa decor closet. They add a nice finishing touch. Super-easy to install (used the special clips for the angle shelves). 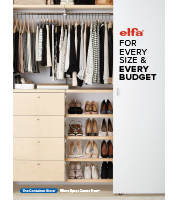 Love that Container Store keeps adding to the Elfa line, my closet systems just get better and better! Rated 5 out of 5 by JNHK from Walnut Fascia Although the walnut fascias are a bit expensive, I think they are worth it! They complete the look of our elfa closet and add a touch of sophistication and warmth. I find that the ventilated shelves look a bit too industrial and cold without the fascia. Definitely invest in these fascia, especially during the annual elfa sale! Rated 4 out of 5 by queenofelfa from BEAUTIFUL finished look These really make a difference on the look of the closet. I have one closet done with platinum elfa shelving, and the master closet is done with the platinum elfa shelving WITH the decor trim. What a difference!! Very classy look, albeit a little pricey. ONE NOTE: The trim is held on with 3 small plastic pieces which fit ingeniously into the groove behind the trim and wedge it firmly in place. These can be very difficult to push in, and even more difficult to pull out if you have to adjust something. I found two tools help with this: - FOR installation, I put each little plastic piece loosely in place and then I have a 2"x2' piece of oak that I place under the shelf and pull back toward me to evenly push these pins in place without hurting my fingers. - FOR removal, I found that one of the elfa shelf hooks can be used sideways to get in behind the plastic piece and leverage it out. Rated 5 out of 5 by Cameron68 from Love my new shelving Bought Elfa shelving for home; after learning curve on first installation, other closets were very easy. Staff at container store were truly helpful, I was impressed by continued customer service. Rated 4 out of 5 by purplesj from Nice but needs work This is an affordable way to make the closet shelves look nicer but there is so much more Container Store could do with these to make them better. First of all offer them in longer lengths. The closets I used these in have a section of 4feet long shelf/clothes rod and it would look nicer with one long piece instead of 2 short ones together. Second, there needs to be a way to cut them to fit shorter sections. If they can cut the wire shelf then why not be able to cut this part too? Rated 4 out of 5 by StorageSolutions from I had some decor Fascia and bought a few more. The birch color was lighter than what I already had. Rated 5 out of 5 by Anita414 from Make your closet PRETTY! Such a simple way to make closet organizing pretty. Rated 3 out of 5 by babeegyrl619 from Great look if in the right size Bought these to spruce up my shoe shelves. They look great and are of good quality. However, I think they look better when they are the same length as the shelf. When you have to have multiple to cover the length of the shelf, they look funky (IMHO). Would be nice if they came longer than 2'. So would recommend only if you have shelves that are the same length as the fascia. Rated 5 out of 5 by Countrychick from Closet redo Bought to add to a total closet redo to fine tune. Easy to take off and put on. Only negative and it's really not a big deal is that if you have wire shelves close together due to design you might not want the fascia trim since it adds to the height of the shelf and in my case made it less efficient use. So I took the rows off of these and it still looked very nice in the whole picture. I used platinum wire. Rated 5 out of 5 by edh1 from Fascia review Your staff is great on designing shelving and drawers for spaces, and your computer program makes everything look great on screen and in print. However, the customer has no idea that your fascia will not cover shelves unless they are exactly 12", 18" or 24" in length. If shelving can and is cut to length to fit into closets, pantries, etc., then fascia should also be cut to fit as well, otherwise shelves look unfinished and amateurish. Suggestion: Have pre-cut notches in the back of the fascia every inch that would enable your staff to cut each length to the specs created by your computer...and your program should tell your staff what length to cut the fascia to cover the non-standard shelves. Also, fascia should be cut flush, not rounded at ends, so that it looks like one continuous piece of fascia. Rated 5 out of 5 by fkagan from Made a great and fucntional closet beautiful When I first installed our Elfa closets in the 2 bedrooms and the laundry room, I was finally able to fit all of my fiancé's clothes, shoes and there was still even a little space for my clothes. But after I invested in the fascia pieces and installed them it changed the whole look of our closets and totally took it up a notch. It looks fantastic and better than any custom closet system ive seen, so big kudos to the designers for adding this little extra touch of class! Rated 5 out of 5 by RedBaron530 from Worth the extra expense My husband and I went back and forth about adding the fascia to our shelves because of the huge cost increase to our master closet project. We finally decided to do it, as it totally transformed our closet into one of luxury! They are so simple to clip on, and it makes the system stand out from just being the standard wire look. Rated 5 out of 5 by DIYViolet from Perfect Finishing Touch The birch fascia adds visual appeal and a finished look. I am glad I opted to include it. It is worth it to have a closet that looks crisp and functions well. Rated 5 out of 5 by AKH74 from Greatest closet system and finishing We have now put the Elfa closet systems in our last three homes. Each time we were pleased by the whole experience from great design staff to the easy installation to the final product! This last time we added the decor package to the bedrooms and I am in love with the look! It was the best extra money that we spent on our new condo! It brought the whole look to a new level and we tripled the space which is the best bonus! Thank you Container Store and your staff! I told my husband that it is one place that I would love to work in retail! How do I take it off the shelf? The clips have a circular opening on each side. Fit a small (5&quot;) screwdriver into the opening and gently flick the clip back toward the wall. It's kind of an awkward angle but I was able to get the clips out without damaging them and then the fascia just lifts off. If you have multiple pieces on fascia attached to the same shelf and not separated by brackets, once one piece is removed, the other pieces will slide sideways off the clips (use gentle but firm pressure and they will move). Fascia will not slide over or past brackets, as the bottom of the fascia will be blocked by the bracket.. Does the Fascia come with the installation clips and if so, how many? Yes, fascia comes with two clips. What if I order 3' platinum ventilated shelving? Would a 2' and 1' combination look continuous? There will be line where the fascia meet. In the overall scheme of things, it's not real noticeable, but for this reason, I would go with two 18&quot; pieces of fascia so the effect is symmetrical with the line going down the center of the shelf. I have 48 inch ventilated shelves, can I use 2x2ft fascia? We bought 4 ft shelfs, but will want to put the fascia on. I didn't realize they don't come in 4 ft lengths. I have seen people say that the 2ft+1ft won't fit a 3 foot shelf. Try the 2ft+1ft solution. It should work. Are these compatible with the gliding shoe shelves or gliding shoe racks? They have a different fascia for the gliding shoe shelves. The facia for the ventilated shelf won&rsquo;t work. What combination length of fascias do I need for the 3 foot ventilated shelves? I purchased one 2 feet and one 1 feet but it is about 1/2 an inch too long! will I run into the same problem if I try two 18 inch fascias? None of the fascia combos will fit a 3' shelf - really annoying &amp; incomprehensible problem considering the overall excellent design. I found this out the hard way &amp; am here looking for tips on removing fascia. Those suckers are really tough to remove, even when you don't mind sacrificing the little clips. Does it fit a melamine shelf? Unfortunately it does not. The Decor shelves have replaced the melamine in terms of a solid shelf with this look. If you have any ventilated shelves though, the fascia is wonderful to use on those. How much depth does fascia at to a shelf? I have a 16&quot; shelf. I know that it sits 18&quot; out from the wall when installed...how much more does fascia add? Adding fascia to the end of a shelf will add 1&quot; to the depth.